Bacterial wilt caused by Erwinia tracheiphila is a serious threat to commercial cucumber and melon production and is rapidly becoming more important in pumpkin and squash cultivation. The expression of symptoms varies with the different crop species. 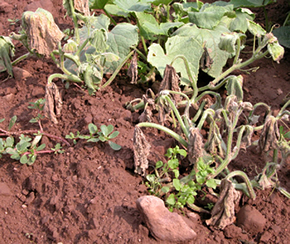 Cucumber and melon plants are severely affected; individual runners or whole plants wilt and die rapidly. Often affected plant parts will appear dark green before irreversible wilt. Wilt is most severe early in the season when the plants are rapidly growing. Summer squash and pumpkin may wilt dramatically during the heat of the day and partially recover by morning. Foliage appears yellow before the entire plant collapses and dies. Young pumpkin plants lose vigor and die within two weeks of initial symptom expression. Weather has little effect on the incidence of wilt, but may influence the rate of symptom expression. E. tracheiphila is dispersed within and among fields by the cucumber beetle vector. The bacterium is transmitted mechanically by contact with contaminated mouthparts and does not reproduce within the beetle. The beetles feed on leaves and stems, E. tracheiphila multiplies in the wound, enters the xylem vessels (water conducting tissues), and moves through the petioles to the stems. Masses of bacteria, gums, and resin plug the vascular system, resulting in wilt. Bacteria spread throughout the plant through adjacent xylem vessels. Infected plants serve as a reservoir of bacteria for subsequent infections. Because this bacterium is transmitted systemically, copper sprays are of no value. Cucumber beetles must be controlled by appropriate insecticide programs. Use crop rotation to reduce beetle numbers in adjacent areas. Spunbonded row covers will exclude beetles. Plant a sprayed perimeter trap crop of Blue Hubbard squash to protect more susceptible crops. Resistant cultivars of cucumber are being developed. No resistance has been identified in melon.